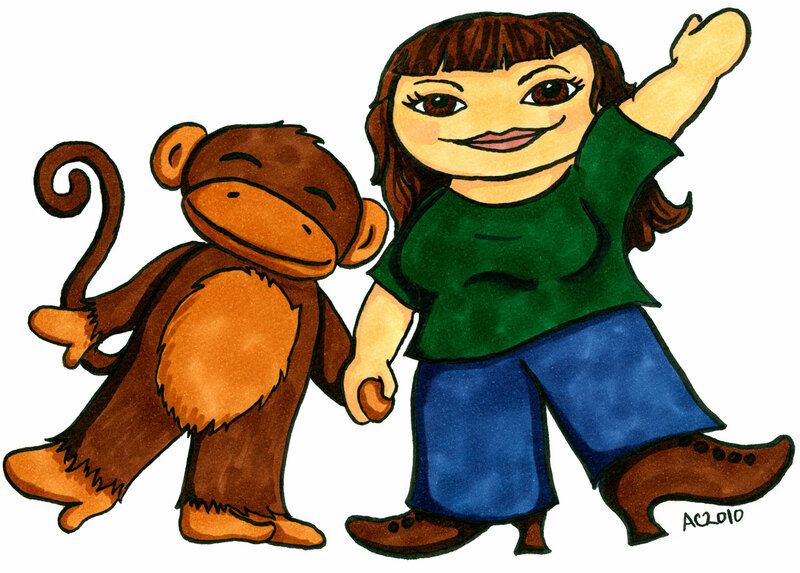 Leila Lloyd-Evelyn doesn’t literally have a monkey, but she wanted her cartoon to represent her sense of playfulness and fun, and dancing with a monkey certainly fit the bill! Leila and I talked about her cartoon for a long time, batting back ideas back and forth before her budget and our inspiration connected and we went for it. Her awesome old-timey boots are monkey brown to match her imaginary friend, her own dark hair and rich coffee eyes, and the deep forest green of her curvy babydoll t-shirt made an excellent complement. Her actual cartoon is a little shorter than my usual weebles, because I drew it sideways on the page (so it’s 7″x5″ instead of 5″x7″), in order to make room for the monkey and their little weebley dance step. Have you thought about being a cartoon? I’ve got a few spots free, and I’d love to draw you in your Halloween costume, holiday glamour, or just your awesome everyday self. You can click here to go read up on what’s what, or just use the buy button below to get going. I’ll email you some questions to the email address from which I got the payment, so keep an eye out!